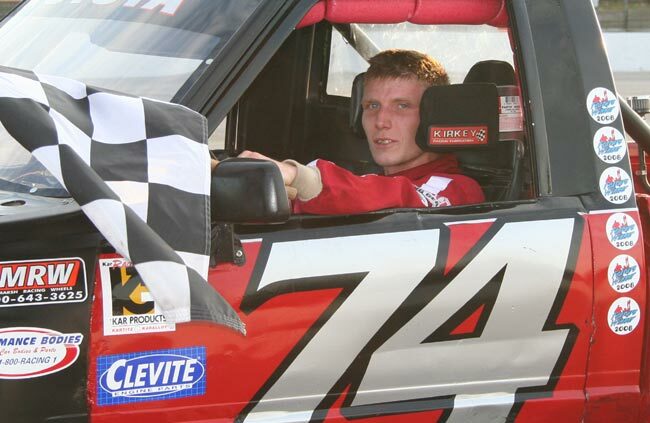 OXFORD, Maine – Jake Burns already has a hammer lock on his second straight Call of the Wild RV Center Sport Truck championship and a probable Agren Appliance Saturday Showdown title to go with it. Now, he's just showing off. Burns made Acceleration Series history Wednesday night, moving into a tie for first as the all-time winner in Truck competition at Oxford with his eighth victory of the season and 18th checkered flag of his career. Trucks existed as a Saturday night division briefly in 1992-93 and returned as part of the midweek Acceleration Series in 2001. Terry Warren set the wins record in the first incarnation of the class. Burns, who didn't begin racing at OPS until 2006, picked up three wins in his rookie campaign and seven last summer. "That's what I was trying to do tonight," Burns said. "The record is what I'm going for right now. It's been an awesome year." Burns probably isn't done establishing new benchmarks this season. 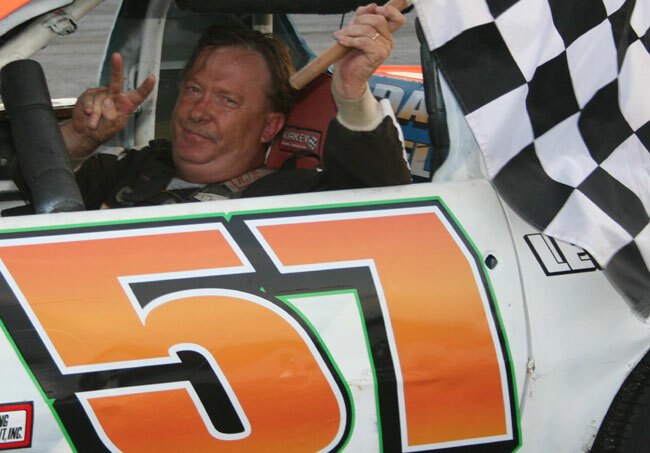 His teammate, "Wild" Bill Irving, owns the single-season Truck standard with 10 wins in '06. 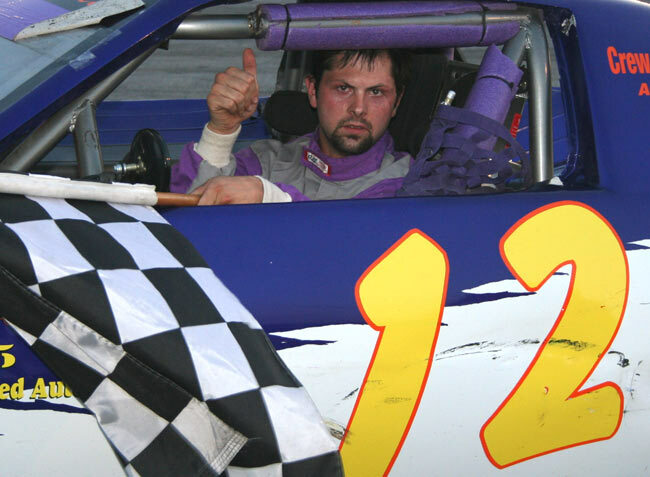 Gregg Norton currently holds the all-division Acceleration milestone with 21 Macdonald Motors Runnin' Rebel victories. Joe Farrar and Opie Allard set the early pace before Burns zeroed in from his 12th starting position and gained the lead on a lap 8 restart. Allard ran second for the balance, with top rookie Russ Spurling strengthening his hold on the runner-up spot in the championship standings by nailing down third. Ryan Farrar was fourth, with Devon Smith rebounding from a solo spin on the first lap to hold off John Lizotte and Tom Libby for fifth. In other feature action on the outset of TD Banknorth 250 Speedweek Presented by New England Dodge Dealers, Archie Watt Jr. captured the Runnin' Rebel 'A' feature. It was Watt's initial Acceleration triumph and his first win of any kind at OPS in four years. David Cook dashed to his second victory of the season in the Rebel 'B' main. After breaking through for his first feature victory in a career that started more than 20 years, Gerry Richard backed it up less than a month later with another Chimney Tech Outlaw checkered flag. Nik Coates and Tyler Belanger joined him in victory lane for the Outlaws, who saw a season-high 56 cars in the garage area spread across three features. Dottie Patria surged to her sixth Allen's Coffee Flavored Brandy Ladies win of a banner year. 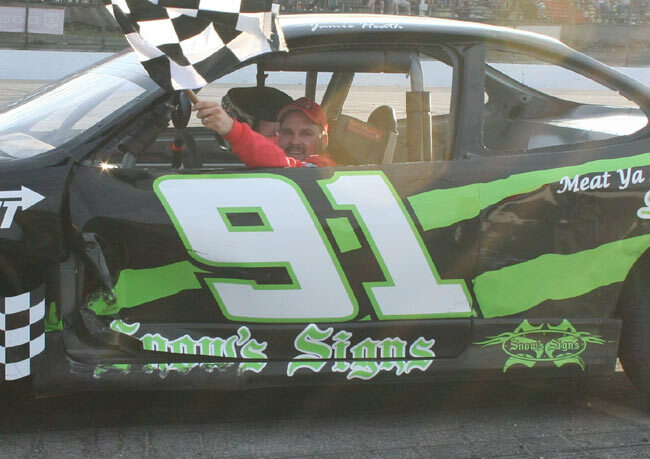 Jamie Heath, reigning champion of the Goulet Home Inspections Renegade division, captured his third straight checkers and fourth overall. Watt stayed in front from start to finish in the high-point Rebel scrap, moving into the lead at the end of the opening circuit when Bill Dunphy and Cole Flagg briefly collided to his inside. Two separate incidents slowed the race with three laps remaining, the most serious when point leader Norton's car slammed into the backstretch wall along with Charlie Webster. Both drivers walked away from the scene. 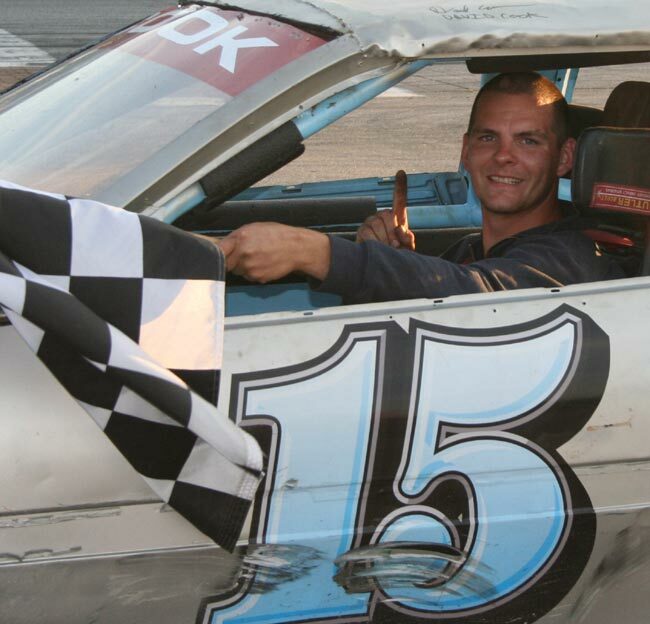 That crash shuffled the running order behind Watt, but the veteran of Late Model, Limited Sportsman and Strictly Stock battles won the three-lap sprint to the finish. "It was tough staying out front," Watt said. Jamie Leavitt followed up his Saturday night win with a persistent charge to second, chased across the line by Scott Farrington, Matt Dufault and Zach Audet. Cook was the class of the field from the second lap forward in the 'B' four-cylinder scramble. Only one caution flag slowed Cook's progress en route to his second win of the year. "Not bad for an old Enduro car," Cook said. "I didn't know if I'd be able to hold on because there were so many fast cars out there, but I guess I was the fastest one tonight." Josh Brown matched a career-best finish in second, with Jeff Beaule holding off Derek Cook for third after Cook rallied from a lap-one impact that wrinkled the front end of his ride. Nathan Guptill completed the top five. Richard raced from sixth to first in less than a lap of the Outlaw 'C' encounter. Then he outlasted two early caution periods and a mechanical problem that would hamper a Sunday joyride, let alone a hard-fought race on the historic, 3/8-mile oval. "I lost the power steering," Richard said. "Brown's Construction bought me four new tires and it paid off." Fred Clavet and Jay Wilkins stayed in Richard's tire tracks but settled for second and third. Dennis Morang moved up the ladder to fourth through the early tangles that claimed Mike Blash and Robert Lowe, among others. Mike Haynes picked up his second fifth-place check in recent weeks. Coates was the inside bread in a high-speed sandwich on lap 6 of the Outlaw 'B' tangle. When early leaders Scott Ellis and John Patria briefly broke loose in that three-wide confrontation, Coates hugged the bottom lane and snagged the lead. Patria finally fought past Ellis for second with seven laps to go. Coates maintained much of his comfortable edge and later drove a smart race after Patria caught him in traffic to salt away his third win of the summer. "I told my old man before the race that the front looked like the place to be tonight," Coates said, "and we got up there. It's been a tough season, but I think it's finally starting to turn around for us." Tina Titus held off Jim Drake in a tough tangle for fourth that persisted throughout the race. Two weeks ago, Belanger dominated much of the 'B' feature but lost out to David Childs in traffic. 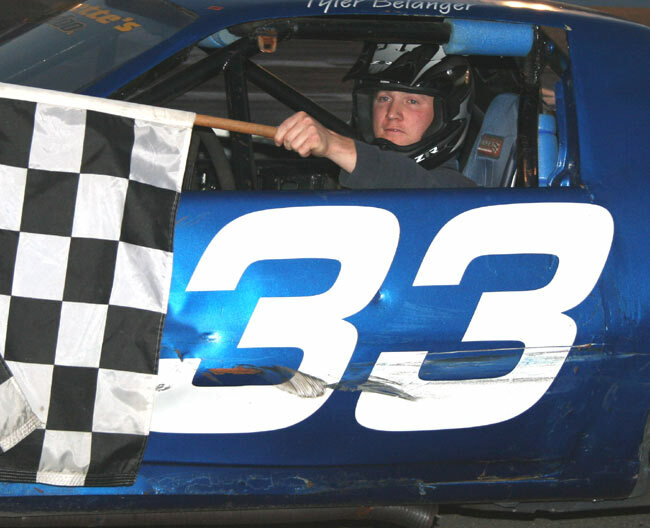 The gain in points from that evening put Belanger on the outside of the front row for this week's 'A' finale, and he left an even stronger field deep in his rear-view mirror throughout the scheduled distance this time. Not even a restart with four laps remaining could slow Belanger. In fact, contact between the pack behind him increased his lead back to a half-straightaway at the conclusion. "I guess that's how it's done," Belanger said. Ron Abbott Jr. gave himself a birthday present with a runner-up trophy, with Zach Bowie moving up to third for his second podium finish of the night after Dan Brown failed the post-race inspection. Addison Bowie continued his championship push in fourth, followed by Keith Landry. 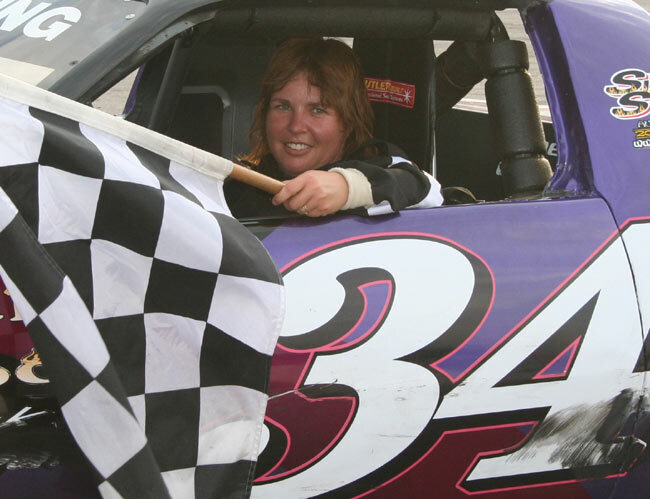 Dottie Patria, like Burns, leads both the Wednesday and Saturday point standings as she continues to rule the Ladies. Missy Blash and Lisa Vining spent time showing the way before Patria's precise dash through the field ended with an outside pass of Vining on lap 11. "Tonight's goal was to keep the car in one piece for Friday," said Patria, alluding to the second half of the Acceleration Series' 250 weekend doubleheader. "So we accomplished that." Defending division champion Vanna Brackett didn't allow Patria to fall asleep at the wheel, hovering within about five car lengths after taking over second from Vining. Christina Spaulding also rallied from the rear of the field to fourth, while Cathy Manchester rebounded from an opening spin to collect fifth. Heath kicked up dust in the turns on two separate occasions, failing to complete early attempts at three and four-wide passes in a wild Renegade sprint. Doors soon opened after those major-league saves, and Heath was a leader by lap 9 after Dan Ellis, Jason Hannigan and Zach Bowie took turns keeping the seat warm. A dirt track-style slide job in the first turn gave Heath the lead for good at Bowie's expense. "That was fun. There are probably some dents and probably a few people who aren't happy," said Heath, "but that's racing. I didn't know if it would stay straight or not. I decided I was either going to the front or going off into the dirt." Bowie was an easy runner-up, with Jason Hannigan protecting the division point lead in third. Craig Bartlett and Gerard Cote trailed the lead trio. All five Acceleration divisions are joined by the Allen's Strictly Stocks and Mini Stocks in a 10-feature program beginning at 6:30 p.m. Friday. 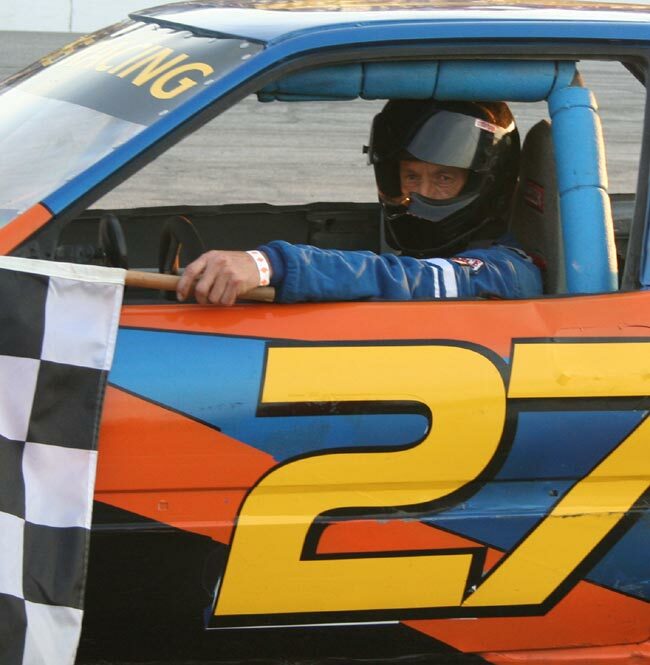 Action on Maine's biggest weekend of racing continues at 6:30 p.m. Saturday with the True Value Modified Racing Series Maine-Ly Action Sports 100 and culminates at 2 p.m. Sunday with the 35th annual TD Banknorth 250. NASCAR star Kevin Harvick is one of 115 preliminary entries for the race, which will pay from $25,000 to $50,000 to the winner. Tickets are available by calling the Speedway office at (207) 539-8865 from 8 a.m. to 5 p.m. Thursday or Friday, or at the ticket office throughout the weekend and on race day. Time of race: 15 minutes, 40 seconds. Lap leaders: Ellis 1-4, Patria 5, Coates 6-20. Lap leaders: J. Farrar 1-3, Allard 4-8, Burns 9-20. Lap leaders: Blash 1-7, Vining 8-10, Patria 11-20. Lap leaders: Ellis 1-2, Hannigan 3-5, Bowie 6-8, Heath 9-20.